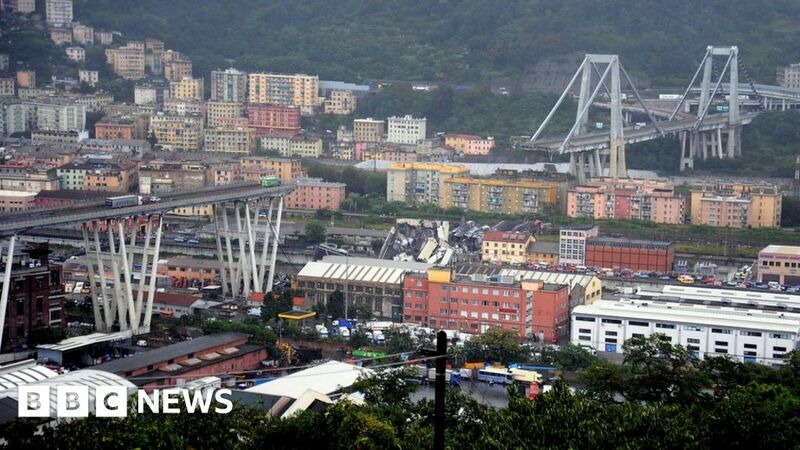 A motorway bridge has collapsed near the Italian city of Genoa, sending vehicles plummeting some 100m (328ft) to the ground and killing at least 11 people, local media report. Italian Transport Minister Danilo Toninelli said it was likely to be “an immense tragedy”. Local emergency officials have been quoted as saying “dozens” died. The police linked the disaster to what they called a violent cloudburst. The collapsed section had mostly fallen on to rail tracks below, officials told AFP news agency, adding that cars and trucks had also fallen. One image posted by the regional emergency services shows a truck perched at the end of the surviving bridge section immediately before the drop, and says rescue workers are operating en masse at the scene. The Morandi Bridge, built in the 1960s, stands on the A10 toll motorway. The missing section was dozens of metres in length, and ran across the span of the Polcevera river. Italian newspaper La Repubblica described that part of the city as “densely inhabited”. The structure collapsed around 11:30 local time (09:30 GMT) during heavy rain. Traffic was queuing on the bridge at the time, an eyewitness told Italian public television. Initial reports indicate there may be people trapped in the rubble.